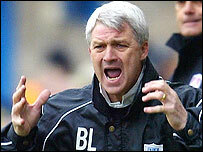 Tranmere manager Brian Little has left the club by mutual consent. The 52-year-old, who joined the club in 2003, took Rovers to the FA Cup quarter-final in his first season and the play-offs in 2005. But Rovers have only managed to win 13 games this season and they secured their League One safety by beating MK Dons last week. "I've thought about this long and hard and am sure this is right for the club and for me personally," said Little. "I've really enjoyed the last three seasons here, despite the problems we have has this season. "I would like to wish everyone at the club every success for next season." Former Republic of Ireland international Jason McAteer, assisted by John McMahon, will take charge of the club's final game of the season against Doncaster on Saturday. The decision was reached following discussions between Little and chairman Lorraine Rogers about the club's plans for next season. "Our discussions have been totally open and amicable," added Rogers. "We both focused on what is right for the club and for Brian. "Throughout this difficult season Brian, as always, has been calm and unflappable. "We would like to thank Brian for the success he brought to the club, especially in his first two seasons here."